In case you’re not aware, the CIDC 2017 streaming can be found at the URL below. 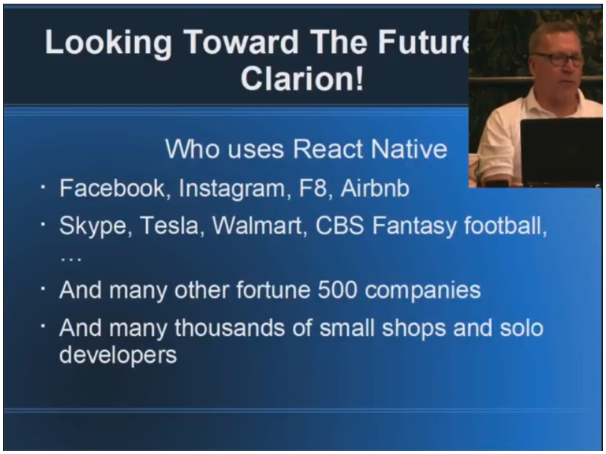 Having only watched the stream, my impression might certainly be wrong, but Z’s Keynote did not seem to elicit a lot of excitement from CIDC attendees. 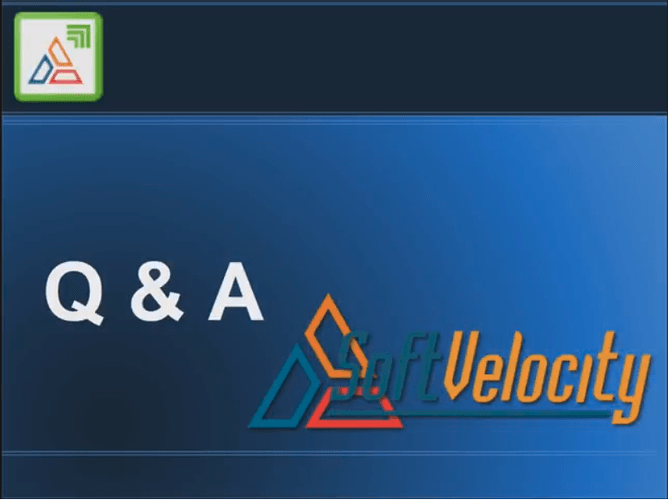 Might anyone like to offer thoughts here regarding the Soft Velocity development plans? Especially interesting would be to hear about the after presentation discussion at CIDC. I grabbed some screenshots and did some quick OCR! 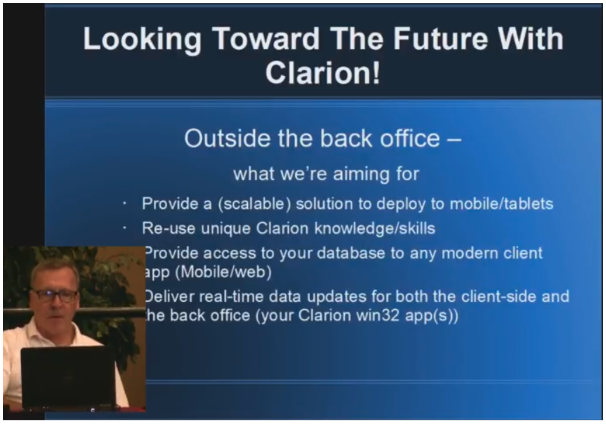 #Looking Toward The Future With Clarion! 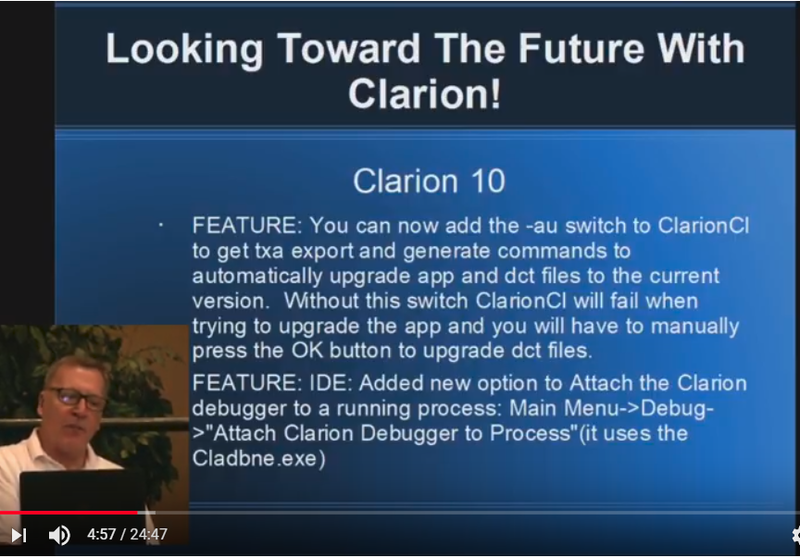 FEATURE: You can now add the -au switch to ClarionCl to get txa export and generate commands to automatically upgrade app and dct files to the current version. Without this switch ClarionCl will fail when trying to upgrade the app and you will have to manually press the OK button to upgrade dct files. 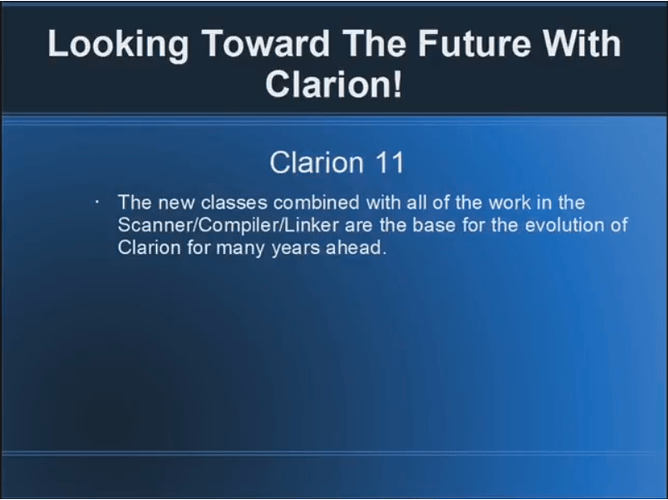 The new classes combined with all of the work in the Scanner/Compiler/Linker are the base for the evolution of Clarion for many years ahead. 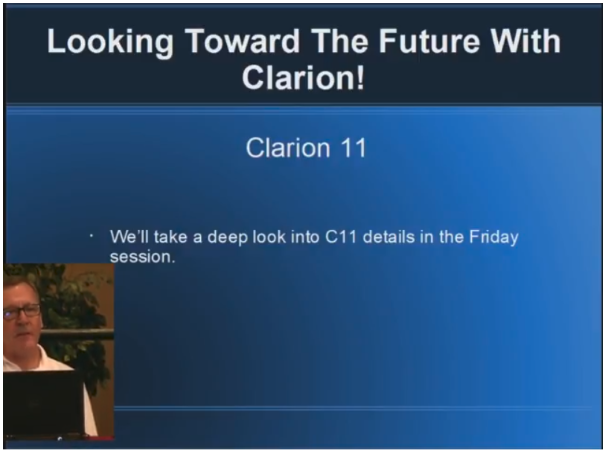 We’ll take a deep look into C11 details in the Friday session. What do you need to meet the demands of your market? Over the last several years we’ve researched and tested most of the available options for mobile dev. And one of the problems we found is that there are too many possibilities, with new ones popping up all the time. If we can generate a nice looking, fully functional mobile client, how do synchronize data between the Clarion back office applications and the mobile client apps? Thanks for the post. My feelings exactly. In my view, the presentation was badly planned and badly executed with no real info. 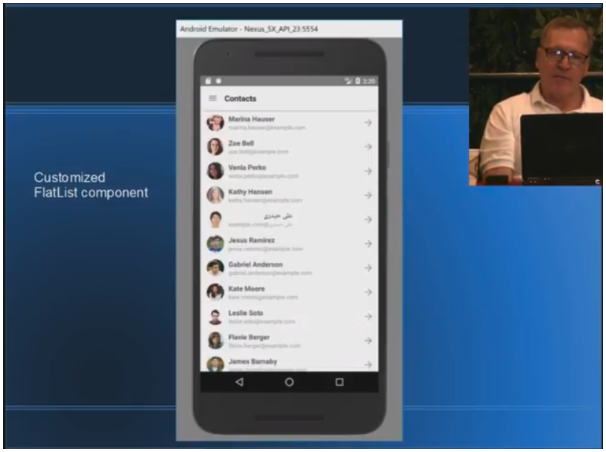 I wonder why Xamarin is not mentioned or is that too much of a competitor? Now they have mentioned about React-Native, the little whatever resources they have right now will be directed towards that and we will end up again with something like H5 Template. It almost looked like they have very limited to boast about C11. 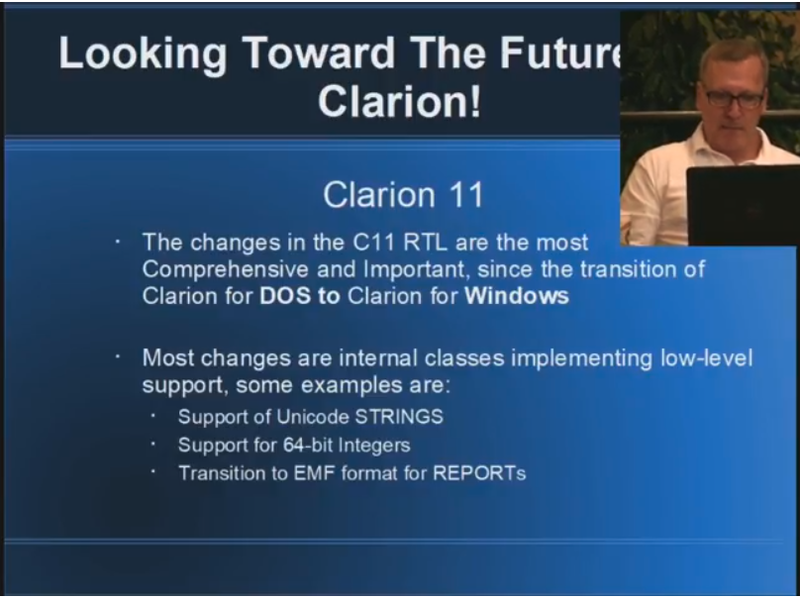 With the unicode support and the major RTL changes in C11, it might take several several versions for it to become stable. 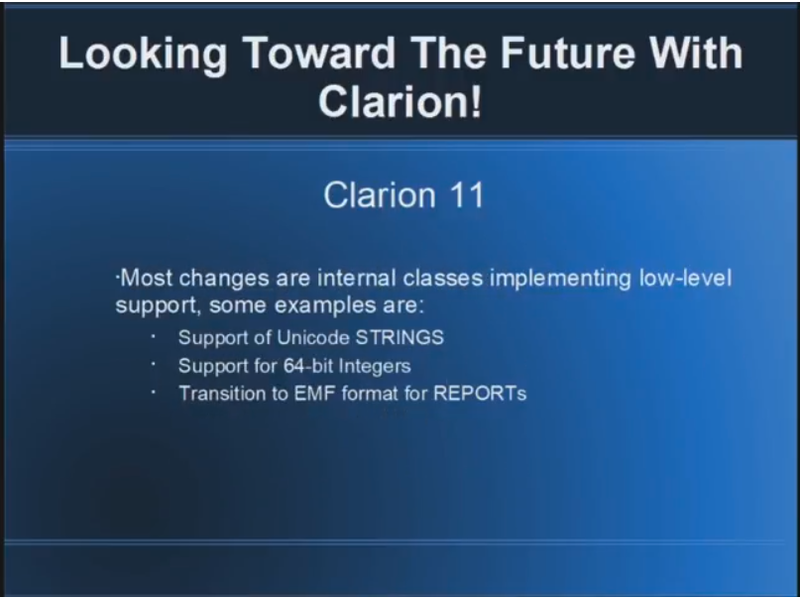 And since there are major RTL changes, I am not confident of compiling my existing C10 solution in C11 and roll out to customers. Thank you for share @brahn. While only SV knows for sure, my simple impression on the H5 templates is little use despite a significant investment of resources. Meanwhile, the SQL/ODBC issues discussed here on another thread remain for several years. 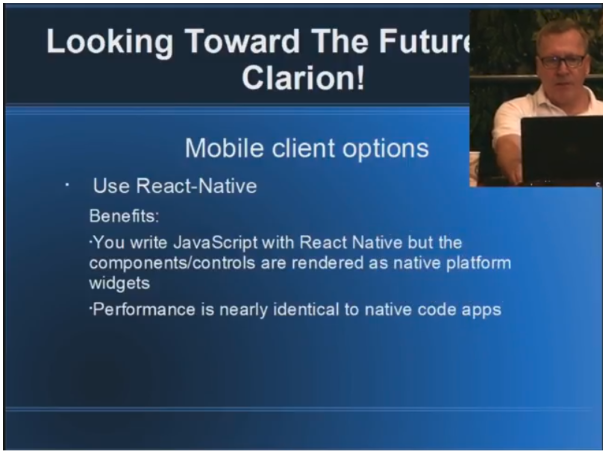 With React-Native now apparently being Z’s favorite, one does wonder if it is a path with real SV market potential or just another hot fade side trip. I haven’t a clue about the answer, but am certainly interested to hear what others are willing to offer. My view on H5: Once again too little too late. 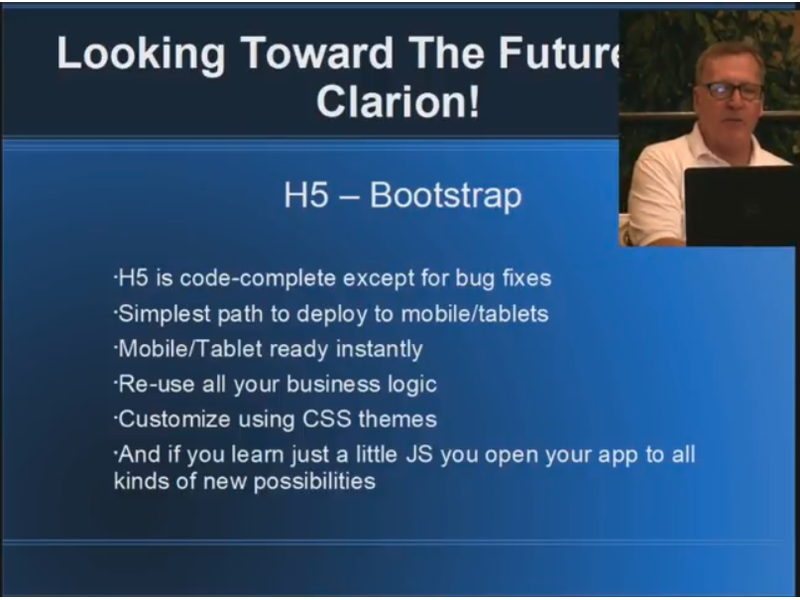 With products like TSPlus and ThinNet, why do you need H5 to convert windows apps to web apps? 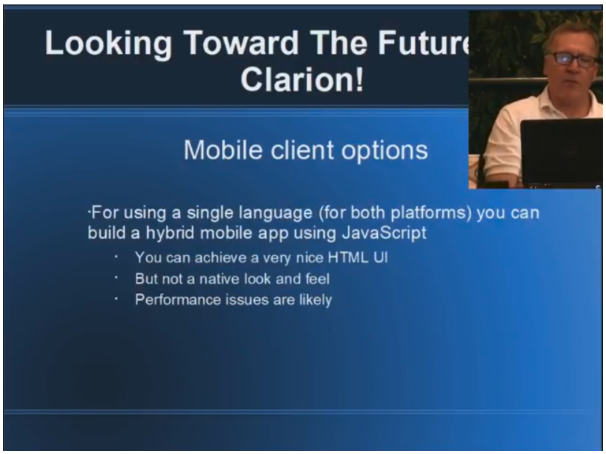 Personally, I would rather use NetTalk for new web apps than using H5. With Nettalk there is a good track record regarding releases, documentation, and support but if we look at Softvelocity’s track record, I would not like to depend on them to fix stuff, document stuff or support me with problems. 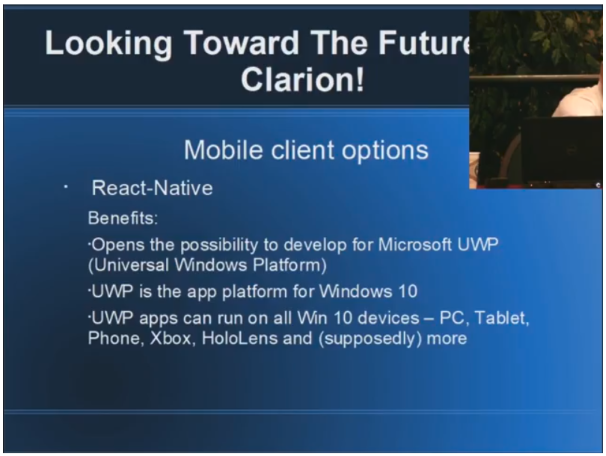 Microsoft’s ReactXP uses one codebase for IOS, Android, WindowsPhone and Windows, so if they can come up with an app generator that uses that (for example) then that is the future of Clarion in a nutshell. I agree with Z that mobile development has been a nightmare in choosing the right platform because there is something new every week. The problem with React Native is that there are still too many options with libraries, UI and plugin options etc to choose from, so choosing the right combination still won’t be easy. 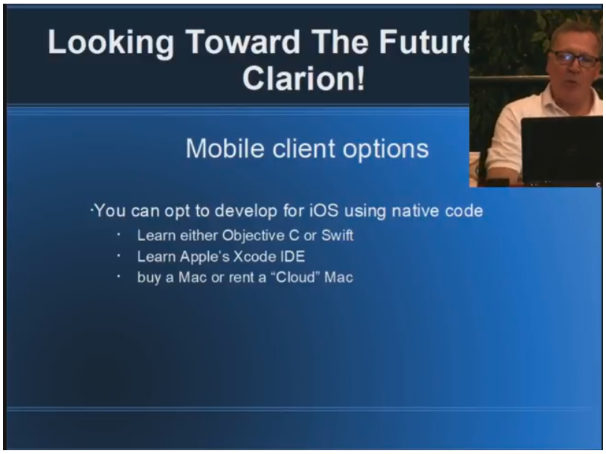 I’m sure H5 has been a good learning experience for Diego, but the commercial opportunities for Clarion are much greater if they can come up with an app generator for all platforms. 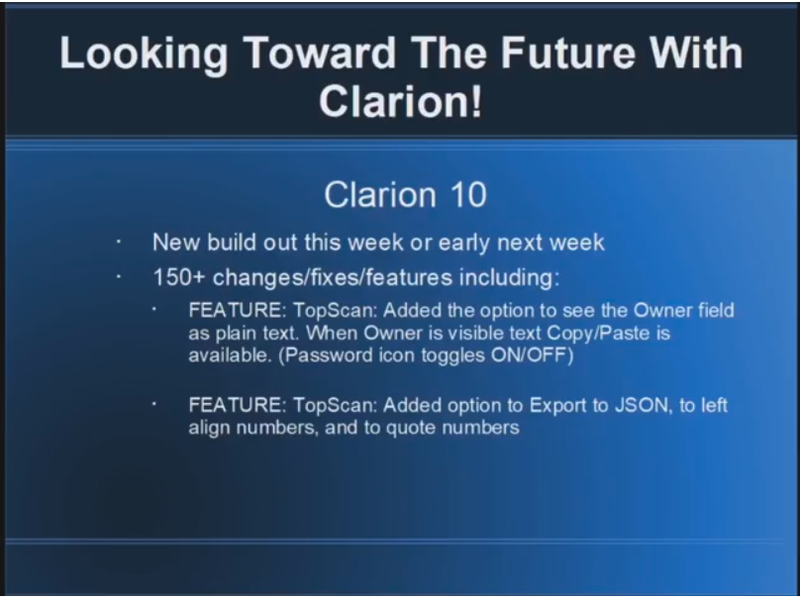 To me the JSON generator he mentioned is just a sideshow for current Clarion developers, I personally can’t see a great need for it as an alternative to existing Clarion methods for handling JSON data. Would probably be very useful if SoftVelocity did a few ClarionLive webinars and fleshed out a few details and got some feedback from anyone currently using these proposed technologies … but I doubt that would ever happen. Thanks for the post. Hopefully a few more folks will offer their thoughts. Sure would be nice to hear more from SV and perhaps have opportunities for customer dialogue. 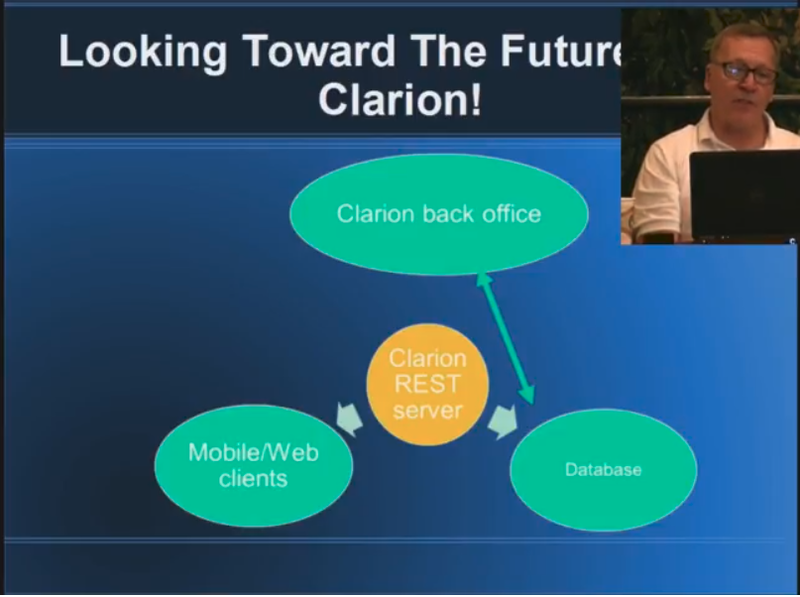 One would think a quarterly appearance on ClarionLive could not be that stressful. Thanks again. We can at least now eliminate Windows phone from the equation, but that still leaves plenty to consider. 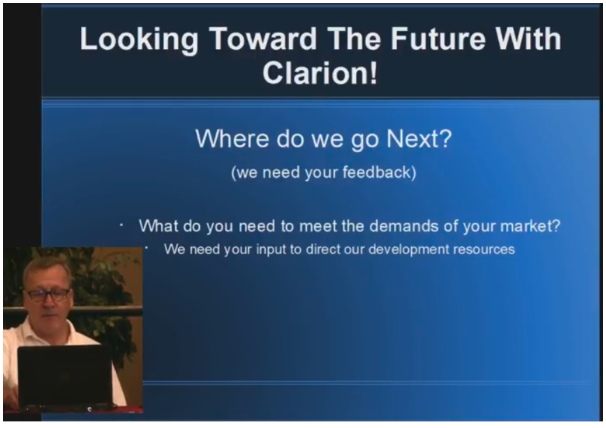 Bob Z has a history of over-promising and under-delivering, so realistically speaking it wouldn’t make much difference what he presented at the CIDC, because most of it would never come to fruition anyway. When you’re a “team” of one (Diego) how can you be expected to work magic? SV needs to open source a lot of stuff, and just focus on the basics. But they won’t, because both Bob Z and Diego see it as letting go of their baby – Bob Z would rather take Clarion to the grave than make even a small part of it open. While the SV track record clearly shows delivery-on-promise problems, I’ve not heard much from Z in regard to open source. With “focus on basics” and open source having long been suggested as the way forward, I’d be interested to hear more ideas as to what in Clarion is basic and what should be open. 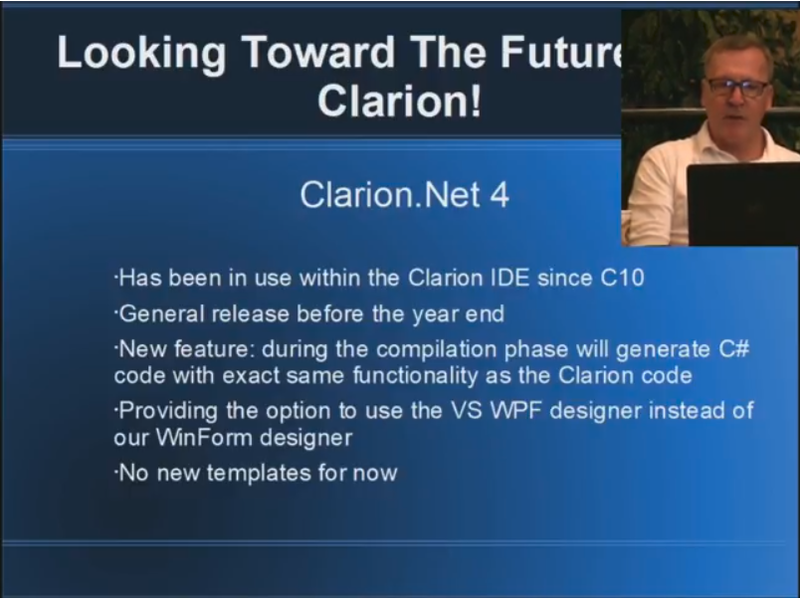 Templates I would think is the most obvious one, and doesn’t really require SV letting go of anything proprietary, because if you have a license for Clarion you already have the source. 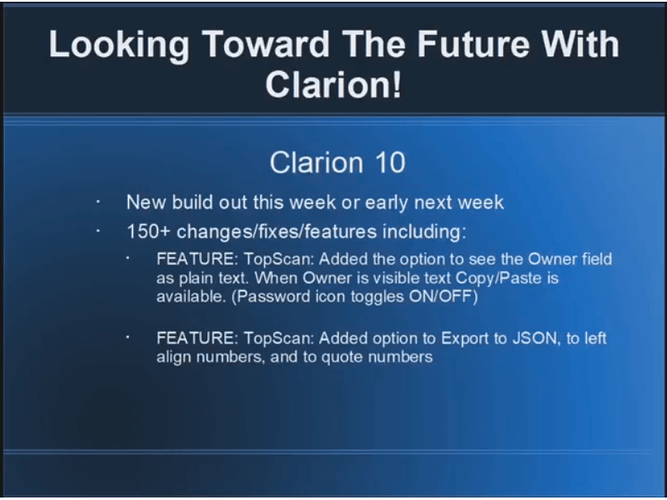 Things like database drivers – or perhaps more importantly an SDK (which I believe may have been available in pre-SoftVelocity Clarion days) to allow people to create new database drivers. 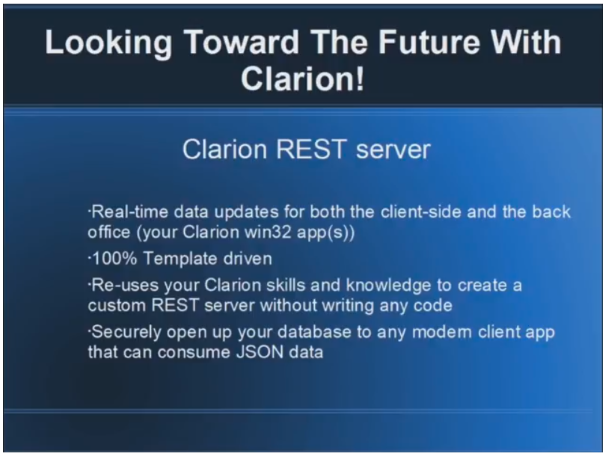 Clarion SHOULD have a native mySQL/MariaDB driver for example, but SV will never do it - they think ODBC is fine. One could go on, but the reality is that SV will never let go of anything, so it’s really only an exercise in academia. Sorry but … did he talk about a new release of Clarion.Net before the end of the year ? 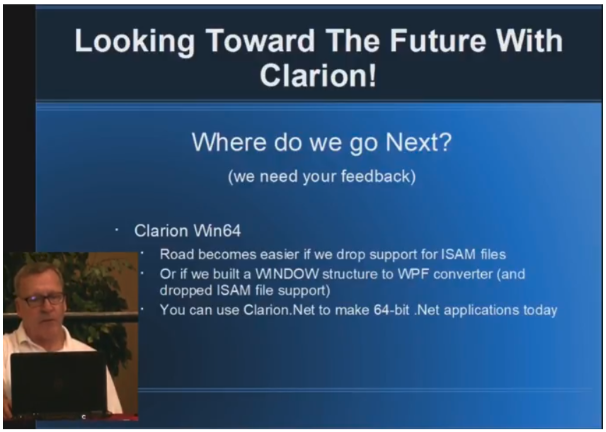 He even talk about writing 64 bit applications with Clarion.Net, isn’t it ??? But … is Clarion.Net a dead project or not ?? ?